I was headed out to the range when I saw The Sand Crab watching TV in the grill. 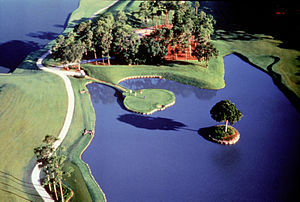 The 17th at Sawgrass was on the screen, and The Crab was staring at it like he was checking his lottery numbers. As I got closer I saw his smartphone, a pen and notebook, and a copy of The Rules of Golf on the table next to his usual beer and well-chewed cigar. “How’s the tournament going, Crab?” I asked. “Watch Pavin real close here,” he replied. “He might ground his club on that bulkhead, and it’s behind the yellow line. It’d be real easy to do.” We watched as Corey Pavin hit his usual precision shot, putting off the bulkhead with the bounce of his wedge. “OK, I guess he pulled that one off,” Sand Crab sighed. I sat down at an adjoining table and looked back up at the screen. A new hole had appeared, maybe the 14th. “And you’re doing what?” I asked. He gave me a self-congratulatory grin and a thumbs up. “Upholding the integrity of this magnificent game,” he said in his best Scottish brogue. The Crab tapped the earpiece of his sunglasses. “Another set of eyes never hurts.” I think he winked, but it was too dark behind those lenses to know for sure. He pointed back toward the TV. “Watch Sergio now. He’ll be really ticked if he misses this putt.” We watched as Garcia rolled in a four footer. I let the door slam like I didn’t hear him. This entry was posted in humor, The Sand Crab and tagged Corey Pavin, golf rules, Padraig Harrington, Phil Mickelson, Players Championship, Sergio Garcia, TPC Sawgrass. Bookmark the permalink.